The New iPad, iOS5.1, and Apps Announced! The new iPad 3 was announced yesterday at the Apple keynote event with specs and release dates, along with software updates for iOS5 and apps. Rather than give it a label, it is simply “the new iPad”. And the new iPad will have a mega quad-core processor, the A5X, as well as a fancy Retina Display, which will be brighter and much sharper than the predecessor. This gives the new iPad a 2048×1536 resolution, and you can expect it to look absolutely stunning. The biggest disappointment was the lack of an SD card slot as expected, and there is still only the usual 16GB, 32GB and 64GB choices. 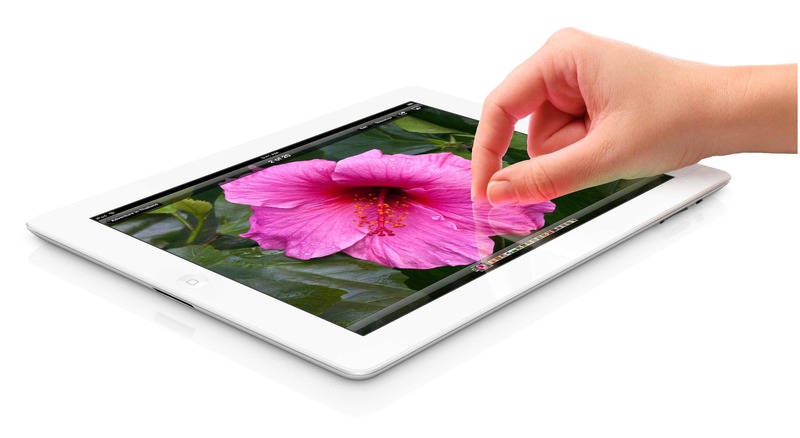 The new iPad will, however, have better connectivity, and will be able to reach a staggering 73Mb/s if you can get 4G. To fit the new tech, the new iPad is slightly heavier than the iPad 2, at 635g, and is also thicker at 9.44mm, but this is a small difference and shouldn’t be that noticeable. And the battery life is the same as the iPad 2, set at 10 hours. The new camera in the new iPad will be a surprising 5-megapixel, but will also have autofocus, and face detection in still images. It will also be able to record video in 1080p HD with video stabilization. As well as the new iPad, Apple are releasing a new Apple TV which will include 1080p video-streaming with Netflix. There will also be proper integration with Netflix and Apple TV, allowing signup and payment options, with both the new, and the old device. In terms of software, all Apple devices can now be updated to iOS5.1, which will bring various bug fixes, as well as the previously-announced Japanese language support for Siri. Available now for iPad is iPhoto, allowing intuitive photo-editing with multi-touch gestures, and the ability to compare an edited photo with the un-edited version side-by-side. It is also easy to correct colour balance, and fix underexposed photos. The new iPad will be available from March 16 in black and white only, and will cost from $499, same as the iPad 2 was on release. Additionally, the iPad 2 is now only $399 from the Apple site. UK prices yet to be announced. The third-generation Apple TV will also be released on March 16, for $99. i wish I waited until the iPad 3 to get the iPad 2 because the prices went down… I never can wait for the next generation because I love Apple ! Their hardware is excellent, I got the iPad 1 about two weeks before this time last year, even though I knew they were about to announce the second-gen… Now really miles behind! As I saw: hardware is excellent, but I have trouble with the software, namely iTunes. Had lots of troubles in the past, but not enough to stop me using the iPads or iPhones. The only problem I have is mainly with the internet. When I open safari some stupid thing pops up everytime about the community tool bar… I have no idea what it is, but nothing bad happens. it’s just annoying. Sometimes my iTunes doesn’t make the connection that my iPhone is plugged into my computer, but I just replug it back in. My problems are just silly things that should be simple, like it being stupidly awkward to sync parts of my phone (like just the music library) without wiping the that is on the phone but doesn’t match up in the iTunes library. Alex: I suspect there will be a lot of other cool tablets out Q2 this year if you don’t fancy the iPad, there were quite a few cool things at MWC and CES.